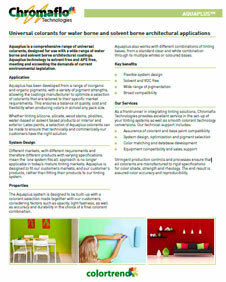 AQUAPLUS™ OC by Chromaflo Technologies is a VOC-, solvent- & APE-free, iron oxide pigment. It is suitable for water- and solvent-based architectural coatings. It exhibits broad compatibility, wide range of pigmentation and flexible system design. It shows good light- and weather fastness. It can be formulated in high alkaline environments and in exterior silicate or silicone based products. AQUAPLUS™ OC is designed for wood stains, and interior & exterior latex paints.